Deputy Chief Justice Raymond Zondo, who is chairing the commission of inquiry into State capture, said on Thursday night that an investigation would be conducted into the leaking of witness statements before those witnesses had given evidence at the inquiry. 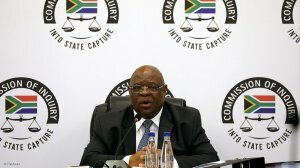 “Since the commencement of the public hearings of the Commission in August 2018, various sections of the media have disseminated and published contents of witnesses’ statements submitted to the Commission in connection with the inquiry of the Commission before the witnesses give evidence before the Commission and without the written permission of the Chairperson,” said Zondo. On Thursday, Gordhan’s 68-page statement was leaked to the media and reported on. While the investigation into the leak was being conducted, Zondo said that media houses should pay attention to the regulations governing the commission, which state that no person may, without the written permission of the chairman, “disseminate any document submitted to the Commission by any person in connection with the inquiry or publish the contents or any portion of the contents of such document”. It was also a crime to peruse any document -- including statements -- that were destined to be submitted to the chairperson “or intercept such document” while it was on its way to the chairperson. Any person who contravened the regulations was guilty of an offence and could face a fine or imprisonment not exceeding 12 months. “These regulations make it clear that it is a criminal offence for anyone ­­­– and that includes the media ­­­­­– to disseminate or publish, without the written permission of the Chairperson, any document (which includes witnesses’ statements) submitted to the Commission by any person in connection with the Commission’s inquiry. “After a witness has given evidence in public before the Commission and his or her statement has been handed up at the public hearing, the media may publish his or her statement or portions thereof unless the Chairperson orders otherwise,” said Zondo.